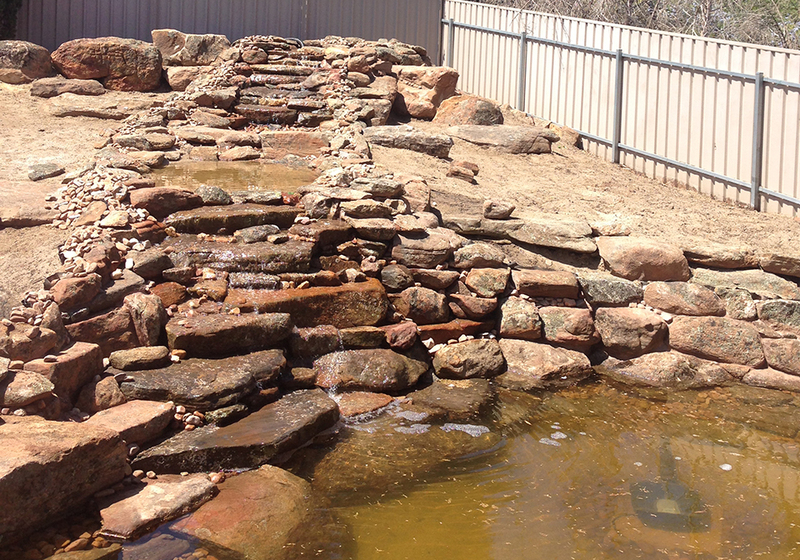 This still in construction pond system by GullyScapes of South Australia forms the centrepiece of an expansive residential landscape in more than just a natural style. Incorporating some of the latest in high tech wizardry and taking cues from mother nature, this pond system will require little ongoing maintenance or monitoring by the client. Using the natural contours of this sloping block, Wayne has designed and built a four stage system. The large lower lagoon has been built to a depth ideal for planting with a variety of water species within a specially formulated multi-strata soil & sand composition, which will aid in the promotion of beneficial bacteria and the filtering of unwanted bacteria. This pond overflows (if required) into a natural gully from where the water can be harvested and diverted to other sections of the lower garden. A twin motor 30,000 litre per hour variable speed pump pushes water up the hill to create the waterfall. This pump is remote controlled to allow a variable flow rate, and the ability to create a tailored ambience to suit the mood of the client. 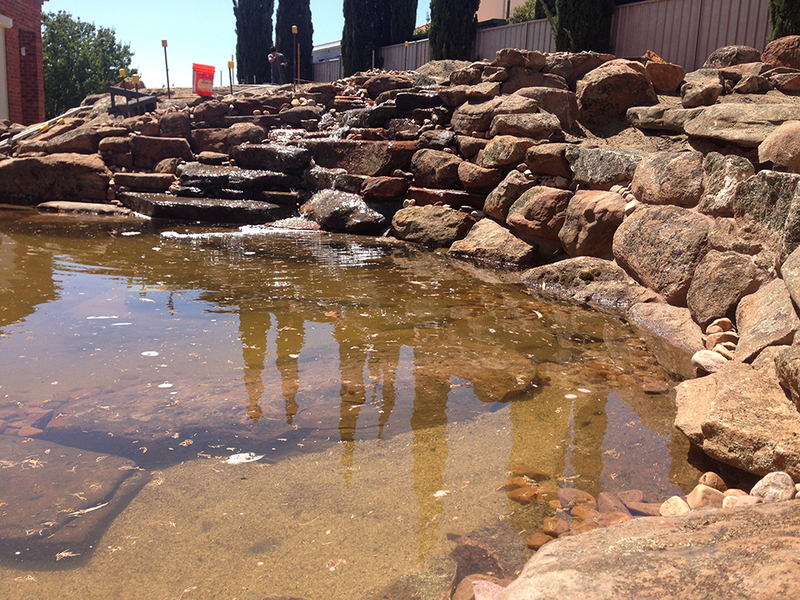 A small upper lagoon creates the first of three waterfall sections. The first and last of which are substantive rock constructions that the water playfully cascades over creating the sound of the quintessential “bubbling brook”. This middle waterfall is a small step down to create two separate mid section ponds minimising the amount of “water in transit”, thereby reducing to zero any water loss to overflow if the pump system is switched off. This system is a great example of a zero chemical/zero filtration natural pond. Systems such as this can be built on almost any scale to fit into the space you have, and not are they only good for the environment, but zero chemical means no ongoing outlay. Even the use of a variable speed pump can generate significant savings in ongoing electricity use. We will definitely revisit this site once the surrounding landscape and plantings have been completed.